Holiday 2012 round 1 is here! 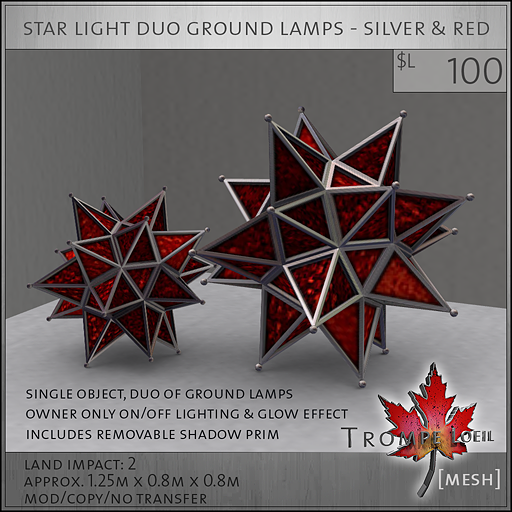 Star lamps, gift boxes and more! 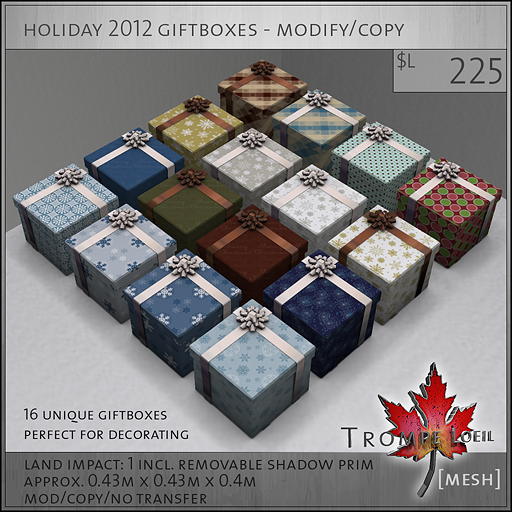 The holiday season is fast approaching and Trompe Loeil has some brand new mesh items – and an update to a popular favorite – to get you in the decorating mood! First up are our beautiful Star Pendant Lamps, Star Duo Ground Lamps and Star Tree Toppers – all based on the popular Advent Moravian star design that translates wonderfully into 3D mesh. These lamps are owner-only light and glow toggle on touch and super low prim for easy and economical decorating. Perfect for the holidays or year round, our Star Lamps come in red, yellow, green, blue or white stained glass in silver or gold metal framing. Available inworld at Trompe Loeil’s mainstore, at our cabin at the Winter Holiday Village, or on the Marketplace! Next up for decorating or for gifting are our new Holiday 2012 gift boxes – 16 unique paper styles in all, with silver or gold ribbons and bows, in either modify/transfer packs or modify/copy packs depending on your needs. 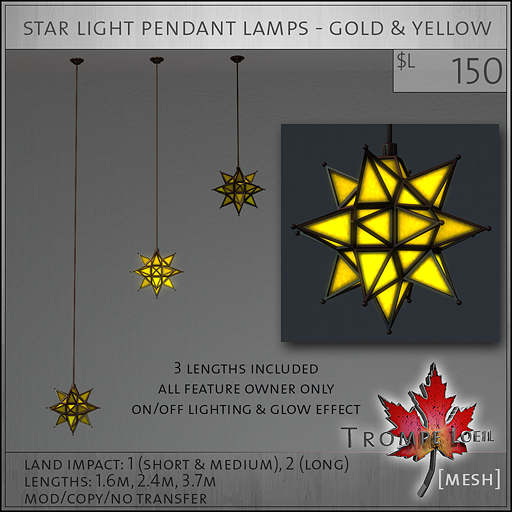 Also available on the Marketplace, at the Trompe Loeil mainstore or at the Winter Holiday Village! Finally, we’ve updated a classic – our Funky Christmas Tree in gold/silver and colorful versions now uses only one texture and is an amazing 5 prims! We’ve sent out updates to everyone that’s purchased it in the last year – if you missed it, just visit the Trompe Loeil mainstore and use the Redelivery terminal to have the updated version sent to you. If you haven’t purchased this fun holiday decoration yet, now’s the time – it’s only $L25! Available inworld at the Trompe Loeil mainstore, at the Winter Holiday Village, or on the Marketplace! We have more holiday goodies in the pipeline to release between now and December 31st, so stay tuned and thank you to all our wonderful customers for a fantastic year!